Rollo does a great clip compilation on Australia’s 9/11 coverage, and then speaks with El Sushi from Japan on 3/11 and Fukushima. This entry was posted in Audio, Audiochats, Recommendations, Rollo on July 31, 2016 by ab. This is worth watching just for her latest fake speech impediments routine. This entry was posted in Celebs, Media Hoaxes on July 28, 2016 by ab. This entry was posted in Boston Marathon, Orlando Pulse Hoax on July 28, 2016 by ab. Another good piece by POM. The more people realize the media is manufactured and created by the intel agencies from TOP to BOTTOM (vertical integration in business), the more they’ll learn it’s a poison that’s not be be played with. William Colby, former head of the CIA, was quoted by Dave McGowan as saying that “The CIA owns everyone of significance in the major media.” Since that statement has been formally “debunked,”there is a good chance it is accurate. I never knew what the word “owns” meant. I assumed it was some sort of contractual arrangement where someone like Anderson Cooper, a known CIA mole*, is told what to cover and what to emphasize. I never realized, as with O’Reilly, Hartmann, Beck, Walters, Jones, and as we will cover in the near future, Tom Brokaw, that CIA doesn’t just “own” these people. It gives them their name, personality, bio, platform, and marching orders. They are not just working for intelligence, they are its creations. It is one thing to know that news lies to us all day every day. It is another to realize that the liars are not even real people. They are zombies. This entry was posted in Media Hoaxes, Media Perps on July 27, 2016 by ab. Where did the bridges go? The could be the title of Judy Wood’s next book. It’s amazing how fast the bridge just disappears. Could they have done that with the WTC on 9/11? Of course they could have, and did. CDI is the world’s most amazing demolition company in the world. There is no doubt in my mind that this is where the towers went.. Right into the “bathtub”. This entry was posted in Controlled Demolition on July 27, 2016 by ab. I don’t get much feedback lately, but I’ll post it all here for you to peruse and possibly answer. Ab, take a look at the images for the recent Dallas Cowboys Bus crash with a van that killed the 4 Chinese nationals in the van. The depicted demolished van pictures are all different and couldn’t possibly be the same vehicle. This took place in my neck of the woods, between Kingman, AZ and Las Vegas, NV. I’m calling HOAX, but why? Keep up the good work. Comment: I love conspiracies and trying to find the truth. Wanted to know a bit more about the thoughts on this page about the 1988 Clapham disaster. I was a school boy at Emanuel and trust me this was very real! No crisis actors, health and safety was not the in thing so that is not a reason to think that this was all a hoax. I was at school that day – feel free to contact me for more info! Comment: 62 yrs old, researcher for 25 yrs. I’ve been following your channel for sometime. Very good information although sometimes cannot listen due to granddaughter and language of some guests, ha! I have a still from one of the news stations, checking on family in Northern BC many things are strange up hear right now with all of the fires, I had been sensing for sometime things were going to get really bad for us here in Alberta. I live east of Peace River surrounded by fires. I don’t know I can send an email to you with a clip from Canadian press. EWWW! Stinks ! Obviously altered but full of symbolism. You know we are reeking of the stench of the pervasive witchcraft in Canada some places worse than others. Fort McMurray is not the only place superimposed of the map of destruction planned for this area. What needs to be done to wrap up 9/11, is to make clear that no one was killed. Fetzer and Judy Wood are using nuke and DEW theories in order to justify the allegation that the government killed 3,000 people and they are going along with the huge amounts of money given to the “victims.” Like Sandy Hook, government and charity money were given to the actors in this farce. It’s all about the money or mostly about the money insurance and getting rid of old real estate. In order to successfully implode the towers, they had to remove all fixtures and people. IMO, Simon Shack has not sufficiently answered this question in a video. The video should be much slower than Sept. Clues and without that distracting music. You need artists who do film work in studios to explain how easily an art department could have mocked up those scenes in the archives. I’m a graphic artist and can visualize how they did this. Also, I would love to hear from a demolition expert on how these steel buildings could have been imploded. I hope you saw Fetzer’s latest video where he did a case closed type of show and explained how the planes in the archived footage were holograms captured on film by cameras from every angle. Also, he explains how the holes in the building facades were made. LOL. Do something please and stop this madness. He has monopolized this topic and elbowed us students out of the way. Enough of JFK too. Let that go completely. This entry was posted in Feedback on July 27, 2016 by ab. With the power of the internet, we can now collate stories. It’s a double edged sword: our controllers can scare us with stories from anywhere in the world, and we can now look for patterns and see if we can see patterns to deconstruct the worldwide templates for similar media events. Therefore, I am introducing an exploding houses category. 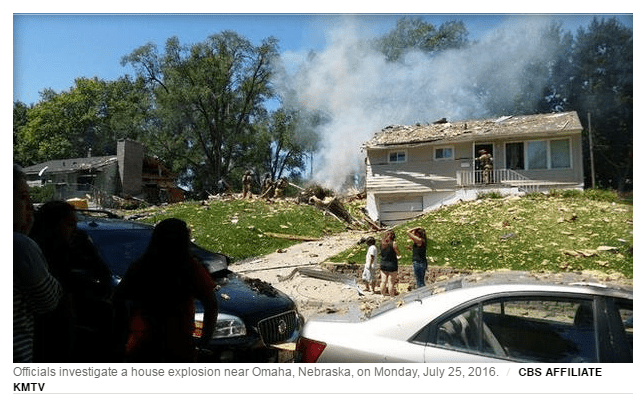 OMAHA, Nebraska — One person died and at least two others were injured when an explosion leveled a house in Omaha.Fire crews responded to a report of a house explosion in Benson, Nebraska on Monday afternoon, CBS affiliate KMTV reported.The explosion occurred around 12:20 p.m.Fire Battalion Chief Tim McCaw says paramedics took two women to an Omaha hospital, and fire officials say one later died. A 14-year-old boy was seriously hurt and taken to the hospital privately. hey are usually blamed on gas leaks. Natural gas and propane are both heavily scented with mercaptan, so even the smallest leak is detected by anyone with a nose. A big leak would smell unbearable. Most people would leave quickly, before any spark could light it up. So are these insurance fires? We all know demolition is much cheaper than piece by piece disassembly – to wit, the WTC. It’s exponentially faster too. This entry was posted in Exploding Houses on July 26, 2016 by ab. This guy was interesting to watch debunk pedestrian youtube and facebook hoaxes – and also recently started asking for money via Patreon. Now, his “alter ego” is discussing our fakeology research, only to be trashed by his “good” personality. I am pretty sure he’s trashing fakeology, but his video, with his silly costumes, does leave me confused. At 4:17, he addresses 9/11. This proves that to appeal to the mainstream, you’d better not question the media fakery that is so obvious to us. This entry was posted in 9/11, Shilling & Trolling on July 25, 2016 by ab.